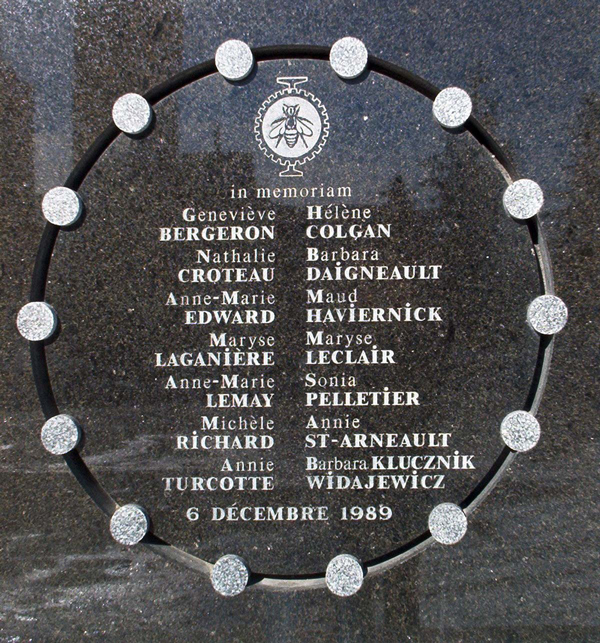 McGill will commemorate the Ecole Polytechnique massacre at the Université de Montreal, in which 14 women were murdered on Dec. 6, 1989, and another 14 injured. McGill’s flags will be set at half staff on Tuesday, Dec. 6, and a memorial service will be held at Birks Chapel (3520 University Street, 2nd floor) beginning at 5 p.m.
McGill will commemorate the École Polytechnique massacre at the Université de Montreal, in which 14 women were murdered on Dec. 6, 1989, and another 14 injured. McGill’s flags will be set at half staff on Tuesday, Dec. 6, and a memorial service will be held at Birks Chapel (3520 University Street, 2nd floor) beginning at 5 p.m.
On Dec. 6, 1989, 14 women were killed at École Polytechnique. They were killed because they were women, because most were students in an engineering program. What has come to be called the Montreal Massacre is an event we are all called upon to remember: violence against women continues to be part of our present. It is 27 years since the murders of these women, and Dec. 6 is again to be commemorated as the National Day of Remembrance and Action on Violence Against Women. It is an occasion to remember the women murdered and for all of us to recommit to ensuring their deaths were not in vain. As we mourn the 14 deaths in 1989, as well as the too many women and girls murdered or abused since then, we need to continue to work for women’s equality, for policies that lead to equity among women, and to an end to structural and individual violence against women and girls. Canada is still not a safe country for all women who live here, with more than 50 per cent likely to experience violence sometime in their lives, usually before they are 25. For some women, those most marginalized, these risks are even greater. Societal and structural policies and programs continue especially to harm single mothers, women with disabilities, and indigenous and immigrant women. These, as well as increasing limits on women’s access to justice and to continuing inequities, may explain why Canada is only at 19th place in the 2014 Global Gender Gap Report of the World Economic Forum. Geneviève Bergeron, 21, was a second year scholarship student in civil engineering. Hélène Colgan, 23, was in her final year of mechanical engineering and planned to take her Master’s degree. Nathalie Croteau, 23, was in her final year of mechanical engineering. Barbara Daigneault, 22, was in her final year of mechanical engineering and held a teaching assistantship. Anne-Marie Edward, 21, was a first year student in chemical engineering. Maud Haviernick, 29, was a second year student in engineering materials, a branch of metallurgy, and a graduate in environmental design. Barbara Maria Klucznik, 31, was a second year nursing student. Maryse Laganière, 25, worked in the budget department of the Polytechnique. Maryse Leclair, 23, was a fourth year student in engineering materials. Anne-Marie Lemay, 27, was a fourth year student in mechanical engineering. Sonia Pelletier, 28, was to graduate the next day in mechanical engineering. She was awarded a degree posthumously. Michèle Richard, 21, was a second year student in engineering materials. Annie St-Arneault, 23, was a mechanical engineering student. Annie Turcotte, 20, was a materials engineering student. It is vital to recall such tragedies and crimes, especially because violence against women is the most common form of oppression in our society. I commend the University for making sure that the dull monotony of the normal–the usual backdrop for indifference–will be interrupted each December 6. I hope to see a large crowd of women and men at the service this evening.